Izanami opens the coffin in the Master Unit and finds it empty. Kokonoe, Kagura, Tager, Makoto, and Hibiki meet to strategize. Noel and Jin are recooperating with Celica watching over them. Tsubaki went off to investigate something, which concerns Kagura. Kokonoe tells the group everything she knows about Ragna. Ragna possesses the Azure Grimoire, which is Death itself, and he's the only chance they have to defeat Izanami. Recap 1: Ragna took down two Hierarchical Cities, beginning with Akitsu, in order to destroy the Cauldrons. Kagura mentions it was a huge pain and that Ragna was the second person to ever receive an SS-class criminal ranking from the NOL. Kagura doesn't know who the first person was because they erased all the documents. Kokonoe says it was her. Anyway, Ragna met and defeated Jin, who was consumed by Yukianesa. The Ragna met Hakumen, but was able to escape. He didn't detroy the Cauldron because his real goal was the 13th Prime Field Device being smelted in the Cauldron. But he was too late, the Murakumo Unit was already activated. So Ragna was really trying to stop the smelting process, he didn't care much about the Cauldrons themselves. Ragna and Nu fought since they mutually wanted to kill each other. Ragna was about to die and Noel was there to save him. Nu fell in the Cauldron. Then Terumi used Noel to Observe him, Kokonoe isn't really sure how that happened. In the past, Terumi cut off Ragna's arm and took away his family and guardian, so Ragna has a grudge against Terumi. Recap 2: Noel was captured by Terumi. Terumi's vessel, Hazama, is comprised of the BlazBlue itself. Not only that, Terumi was his creator. Terumi easily defeats Ragna and awakens Noel as the Kusanagi. Not even she was aware that her true form was as the 12th Prime Field Device. Terumi re-smelted Noel into her awakened form in order to destroy the god of this world, the Master Unit. Lambda, who Tager recovered from Ibukido and Kokonoe patched up, saved Ragna from being killed by Terumi. Lambda saved him because she had part of the 13 PFD's soul in her when Kokonoe retrieved her from the Boundary. Ragna absorbed the Idea Engine, an uber high powered engine Kokonoe developed based on the artificial causality weapons that could compete with Nox Nyctores. Ragna got a power boost strong enough to beat Terumi. Then Ragna sacrificed his left arm in order to pull Noel out of the Kusanagi. (Kokonoe later replaced Ragna's arm.) Izanami appeared. She is Ragna's little sister. Ragna went to meet her in Ikaruga. Everyone, for their own reasons, also went to Ikaruga. Recap 3: Jin arrived first, in Akitsu, probably to see a Murakumo Unit before it was smelted. Jin seemed calmer than in Kagutsuchi. Jin was attacked by someone, then agreed to go see Kagura with Hibiki. Kokonoe guesses Jin fought Relius, who was trying to get the Akitsu Cauldron back online. Then Noel, Makoto, and Tager arrived. Kagura had been plotting against the NOL for a while, but needed an ace before acting. That ace was Celica, who could nullify Seithr and activate Kushinada's Lynchpin. Then Kagura captured Ragna. The group took care of Azrael (who escaped his prison) and Tsubaki (who was under the Mind Eater curse.) Kokonoe sealed Azrael into another dimension and they broke the Mind Eater curse. Izayoi is the Immortal Breaker and plants the idea of death directly into its victim's minds. But the Power of Order is unaffected. When Tsubaki thought she killed Jin, she was able to break her curse. Kagura's group attacked when Izanami's group tried to summon the Master Unit. Using Phantom and her magic, Izanami was able to break through all of Kokonoe's defenses and teleport into Yabiko. Izanami summoned the Master Unit by sacrificing a ton of souls. A massive Cauldron opened in the sky and the Master Unit came out. Then Take-Mikazuchi was brought down from orbit. All the people who turned into Seithr during the ritual could still be revived if the Master Unit was intact. Take-Mikazuchi is a body of Seithr and requires Seithr to function. All the Seithr was generated from Relius's special cauldron. Kushinada's Lynchpin was thrown in the Cauldron, removing all Seithr. Then Ragna easily took down Take-Mikazuchi. Kokonoe equipped Ragna's Idea Engine with a noise canceller, which was designed to allow only him to use Seithr. Izanami awoke the Black Beast in Ragna, transformed Take-Mikazuchi into a giant sphere, and vanished. Ragna is like the Black Beast with no heart. He defeated Jin and Noel. The black sphere is what Rachel calls the Embryo. It's a mystery, but there's a massive Phenomena Intervention perpetually occuring within the sphere. Takamagahara, unlike the Master Unit, can only affect its own plane. Likewise, the Embryo can only affect the things inside it. The Black Sphere might be alive. Homura is hiding out in Naobi with the remaining Duodecim and leading efforts to protect the cities. Celica meets with Tsubaki. Tsubaki goes to talk to a bedridden Jin. Tsubaki recaps the situation and says the Seithr within the Federation resembled the Black Beast. Jin tells Tsubaki that Ragna is his actual brother. Tsubaki wants to know about Jin before he was a Kisaragi. Jin's first memory is within the walls of a room painted gray with Ragna and Saya. There was a large shockwave and then they were at the church with a Sister. Jin vaguely remembers trying to kill Ragna while the church burned. He also remembers someone telling him to do it. That was the same day he received the Yukianesa. Jin thinks Yukianesa was built to kill the Black Beast and believed Ragna was the Black Beast, which explains the insanity it forced on Jin. Jin now wants to wield Yukianesa to destroy the Black Beast. He feels it's his destiny. Tsubaki says he's wrong and that Jin is destined to be a leader. Noel comes in and Tsubaki leaves. Jin demands Noel's account about what happened when they fought Ragna because he can't remember. Jin's memories as the Power of Order have been modified or erased. He thinks Ragna somehow did it. Noel recounts. Jin attacked Ragna and Noel was distracted by the Imperator. Noel saw a large gate and then her memory cuts out too. Jin orders Noel to find Ragna before Tsubaki does. Noel leaves. Jin starts talking to Trinity, who has no form and can move between Nox Nyctores. Noel meets Rachel in the hallway. Rachel wonders if Noel really doesn't remember what she saw. Rachel wants to know what happened to Noel's Godslayer power and that it seems a part of Noel was removed. Ragna went beserk and swallowed Noel and Jin. Rachel thinks that's how they lost their powers. Noel can only remember the gate. Rachel wonders if it's related to the Azure Abyss. Rachel says the Black Beast's existence is a cauldron itself. The bigger its power becomes, the more the Black Beast is drawn towards the Azure. When the Azure Grimoire comes into contact with a strong soul, the Black Beast is born. But that soul can't be anyone's soul. Rachel says if Izanami summoned the "real" Black Beast, then neither one of us would be standing right now. Rachel tells Noel to concentrate on remembering what she Observed. Then they're both abruptly somewhere else. Kokonoe lost track of Noel and says Phantom didn't take her. They're next to the Master Unit and were summoned by Izanami. Rachel says that if Izanami's goal is really just he Day of Reckoning, Izanami already won just by summoning the Master Unit. Rachel asks Izanami why she summoned Take-Mikazuchi and created the Embryo. Izanami says it's because she wants complete death. They ask what Izanami did with Ragna, but Izanami says it's Noel who sealed him away. Noel unwittingly Observes Ragna in the Embryo, delighting Izanami who was also searching for him. Izanami says it's time for the qualified to battle. Ragna wakes up in the middle of a forest with amnesia. Jubei meets him, but Ragna doesn't remember anything. Jubei says he needs to go hurry investigate something then tells Ragna to go to Kagutsuchi. The time period seems to be the beginning of Calamity Trigger. Substory: Tao says she's going to be graduating from being Bang's apprentice. She'll be a Vigilante and hunt the Grim Reaper. She can smell his presence. Substory: Rachel wakes up in her castle, confused because she was just with Noel. Rachel says she must be in the Embryo. Valkenhayn says she must stay here because she's losing her power, although he doesn't remember why. Rachel says she needs to find Ragna and Noel. Ragna arrives and meets Taokaka, who is hunting the Grim Reaper. But she gets hungry and demands food instead. They unintentionally dine and dash. They end up in Ronin-Gai and meet Carl, who is hunting Ragna. Nirvana defeats Tao. Carl doesn't want Ragna's bounty, he wants his Azure Grimoire. Carl attacks. Carl isn't strong, but Nirvana is. Ragna tries to disable Carl, but Nirvana protects him. Ragna and Carl are injured and Carl escapes. Bang appears and takes Ragna to Litchi for healing. Lambda says there are abnormal Seithr readings. Kokonoe is excited and sends Tager and Bullet out to find the Grim Reaper. Substory: Platinum is lost. She runs into Bullet, but Bullet can't see her. Platinum is invisible to everyone. Substory: Hazama talks to Terumi. Terumi has no form and they aren't fused. Hazama seems like he doesn't have his memories of these events, but Terumi clearly does. Terumi says things are about to get interesting. Flashback to Jubei being patched up by Celica after first rescuing Ragna, Jin, and Saya. He says they were being used for experiments in the lab. Celica says she'll care for them. She wins a apprehensive young Ragna over with her kindness. Substory: Linhua is worried about the Grim Reaper. She thinks she saw him, but Litchi knows it was just Tager. Litchi goes out to find him. Litchi just wants to ensure Kokonoe isn't after Arakune. Litchi warns Tager the Library is on the move. When Litchi is alone, she guesses Kokonoe is after the Grim Reaper, who has the Azure Grimoire that Roy wanted. When Litchi gets back to the clinic, Bang brings in the injured Ragna. Substory: Celica finds Ragna's wanted poster. She clearly has her memories. Kokonoe is confused to see Celica and Minerva on her survellience cameras. How do they exist in this era? Ragna is healed in Litchi's clinic in the morning. Litchi knows he's the Grim Reaper, fills him in with some info, and gives him advice on how to hide from the Library. Litchi, Ragna, and Tao go to hide in the Kaka Village. Bang is sent to see what the Library is doing. Substory: Noel wakes up confused. Tsubaki says they're part of the 4th Division on a mission. Makoto is part of the Intelligence Department, collaboriting with the 4th Division. It's all their first time to Kagutsuchi, but Noel feels like she's been there before. Makoto teases Tsubaki for her choice of "casual" clothes. Kagura, the "Hero of Ikaruga", arrives in Kagutsuchi. Kagura flirts with a girl and Makoto punches him. Makoto is on edge because Jin, Tsubaki's crush, is missing. Tsubaki and Noel reiterate they're on a mission. Hibiki says they're here to get Jin Kisaragi and capture the Grim Reaper. Ragna and Litchi hide in Kaka village. Litchi asks about Ragna's black right arm, but Ragna is really defensive about it. Ragna asks about the "Hero of Ikaruga", who she claimed is after him. She says it's Kagura Mutsuki, the man who put down the Ikaruga rebellion before it spread. Ragna feels that's wrong for some reason. Later, the Kaka village kids try to play with Ragna. He vaguely remembers the his childhood at the church and a trip to collect raspberries. Substory: Mu notes this Kagutsuchi is different than the one Rachel created for her. She runs into Makoto, who attacks her for betraying her and Tsubaki. Mu reasons that this Makoto isn't real and defeats her. She wonders if Terumi made this place. Jin notes that this place is exactly like the start of Calamity Trigger. He is currently maintaining Trinity via the Power of Order. Flashback to Yabiko during Episode 1: Trinity asks Jin to contact Luna and Sena. She says that in order to defeat Terumi, she needs to bring them to Jubei. Since Hazama and Terumi are separated, it's the time to attack, but Trinity used all her power injuring Hazama. She can't even re-enter Muchorin. Trinity is asking Jin because he's strong and says she'll smelt a body for him that can move and fight. Trinity says she can create a body in an hour, but it won't last long and Jin won't be able to return to his original body later. Jin agrees to do it so he can move again. Trinity says if unstable Platinum stays in an unstable place like this, it could affect them and they could disappear. Substory: Kokonoe and Tager talk about the 4th Division arriving. Kokonoe silently wonders why it's not Jin and Noel. Kokonoe talks to Mai, a member of Sector Seven, who volunteered to help. Kokonoe tells her to stay away from Ragna because she doesn't know how their Grimoires would react. Mai says Kokonoe should get an assistant, Kokonoe remembers Roy. Noel runs into Sector Seven's Bullet. Bullet attacks, Noel wins. Tager appears and escapes with Bullet. Noel can't use her communicator when Hazama appears. He says Kagutsuchi is being jammed by someone, maybe Kokonoe. He tells Noel that the Grim Reaper is in Kaka Village, but he needs to go report to the main branch. Noel decides to go to Kaka Village. Terumi is very annoyed he has to start over from the beginning. Substory: Bullet tries to capture Arakune on Kokonoe's orders, but Arakune is far stronger and more intelligent than he was supposed to be. Makoto meets Kagura alone. They're the ones jamming communications. Kagura is wary of Hazama. He tells Makoto to go meet "them." Bang bursts into Ragna's room saying an NOL soldier is on her way here. Ragna decides to sneak out through the sewer. Substory: Makoto meets Relius, who comments how interesting the current events are and how everyone has adjusted to the information they were given. He wants to study the relationship of souls to memory. Makoto gets a really bad feeling and runs away. Litchi meets with Noel and is smooth talking her until Bang runs around shouting that the Grim Reaper has run away. Litchi runs off to find him, Noel chases. Ragna meets Arakune. Ragna's arm hurts and Arakune leaves because he senses a stronger Azure. Arakune finds and attacks Noel. Ragna saves Noel. Litchi saves Arakune before Ragna finishes him off. Ragna realizes Litchi knows Arakune and she was only helping Ragna for this. Litchi tells Ragna he has the BlazBlue, the only grimoire in the world that can directly access the Azure, the strongest and worst grimoire. Litchi wants to use the BlazBlue to heal Arakune. Noel stirs and Ragna wants to help her even though Litchi suggests killing Noel. Ragna sees a tatoo of "12"/Murakumo on Noel's exposed chest. He sees a vision of Nu. Substory: Tsubaki retrieves Noel from the sewers. Ragna runs into Tager. Kokonoe wants the BlazBlue so the NOL can't get it. She is amazed the BlazBlue repaired a wound from a Nox Nyctores. She asks if Ragna knows Terumi. Then she tells Tager to apprehend Ragna, or at least stall him. Tager struggles. Kagura appears, who was cooperating with Kokonoe. Kagura easily captures Ragna. Substory: Nine meets Carl and remarks how unremarkable he is since he lost his memories too. She says it's ironic she and her father both worked with Relius. Nine tells Carl that Relius caused the Dark War. Childhood Flashback: Young Ragna is sick. Jin and Saya are worried, but the Sister says it'll be okay. She tells Ragna not to push himself so hard. Ragna wakes up in prison. Kagura reads the charges: Ragna destroyed the Cauldrons in two Library branches and annihilated the division stationed in Akitsu. There were 2000 casualities and 100 buildings destroyed. Kagura says it's serious, the only reason Kagura didn't kill Ragna on sight was because he helped Noel. When alone, Kagura feels something isn't right. Substory: Mu wonders if the Kagutsuchi branch was created by her will too. Tsubaki appears and says Mu brought the world to chaos. Mu beats her. Tsubaki says Mu even denied herself and her existence just causes the hopes and dreams of others to be severed. Tsubaki disappears. Mu realizes this isn't a place, it's an event. Ragna wonders if he's really such a bad guy and maybe it's better if his memories don't return. Rachel is imprisoned in the cell next to him and chastises Ragna. Kokonoe came to the NOL branch to meet Ragna. She took the needed precautions. Kokonoe says she needs to figure out why Hakumen and Celica exist and are in Kagutsuchi. Kagura says the NOL is chaotic since Homura has only been Imperator for 2 years. Kokonoe wants to meet Ragna, but Hibiki says Hazama has arrived to meet him too. Substory: Naoto lands and knows he's not in Shin-Kawahama. Jin meets Jubei. Jin tells Jubei everyone's memories are distorted. Jubei believes him and goes to investigate. Substory: Litchi finally finds Arakune alone. Arakune senses the Azure, the power of origin inside the Boundary, from her. Litchi gets some memories back and Arakune screams about the Abyss hurting him before running away. Naoto arrives in Kagutsuchi. He says he's in another world and it's useless travelling through the Boundary if he doesn't know where he'll end up. He needs to find 'her' soon. Naoto runs into Celica and describes the person he's looking for. Celica thinks he's describing Rachel and they travel together to find her. Noel leads Hazama to Ragna's cell. Noel feels uncomfortable around Hazama. Ragna insists he lost his memories. Hazama tells Ragna to remember the Azure and the burning of the church. The branch is suddenly attacked. Hazama says there's no changing "established harmony." Noel and Hazama leave. Substory: Hakumen is in Ishana during the Dark War era. Trinity appears and tells Hakumen that he fought for his own sake during the war, whereas everyone else fought to survive and protect. Hakumen agrees he fought for his own atonement, but that he accepts his reasons. Valkenhayn appears and wonders if the war was worth all the deaths. Jubei wonders what they really accomplished. Maybe it would have been better if humanity was wiped out, maybe that was the natural order of things. Celica says she's tired of working so hard when the future ends up so bleak. Hakumen tells Nine these illusions are useless and uses Winter's Repost to break out. The lights go out and all of Ragna's restraints are gone. He frees Rachel and leaves. A soldier tells Tsubaki that it seems Hakumen has attacked and is heading to the Cauldron. Tsubaki doesn't see how that could be true. Substory: Rachel notes Ragna is doing what he always did. Why is the Embryo recreating this event? Amane chats with her and says he's just here as an Onlooker. Rachel says he's a better Onlooker than she was since she does what she wants, even if it means breaking the rules and dying. Ragna meets Hakumen in the basement. Hakumen attacks, Ragna activates BlazBlue. They fight. Noel wakes up after the floor collapsed while she was heading to the basement chasing Hakumen. She makes it to the Cauldron to see Ragna and Hakumen fight. Nu emerges from the Cauldron and faces Noel. Noel activates as a Murakumo. Nu attacks. Noel wins and her mind comes back. She reiterates that she's Noel, not Murakumo. Nu attacks Noel again, but Ragna saves her. Nu asks Ragna if this is the 3rd or 4th time. Ragna says he came to save her. Nu says it's disgusting. Humans are imperfect and deny others to please themselves. She wants him to kill her. Ragna says humans are imperfect, but naturally good. Conflicts are from misunderstandings. They fight. Ragna easily wins, which surprises Noel, Hazama/Terumi, and Rachel. Ragna offers his hand to Nu to save her. Everything distorts. Substory: Mu makes it to the Cauldron, but is attacked by Kagura. Kagura says she defeated the Grim Reaper, then destroyed most of the Hierarchical Cities. Kagura tells Mu to quit acting like Noel when she's just the Sword of the Godslayer (Kusanagi). Mu remembers Noel split her off and wonders why Noel did it. Mu defeats Kagura. Ragna is with Nine. She mocks him for trying to save someone by literally extending a helping hand. She's impressed he regained some of his memories on his own. She says Ragna wasn't "chosen" by the world/her, but is somehow still here. They fight. Nine wins, but is surprised Ragna lasted so long. She wonders if he's really the "Man of the Azure" like Relius says. Ragna gets all his memories back. He breaks free from Nine and says he'll save Saya, Noel, and Mu once and for all without killing anyone. Nine tells him the only way he can fulfill his dream is to kill Izanami. Then Nine performs a massive Phenomena Intervention. Then the intro finally plays. This game is gonna be long. Izanami's vessel is being repaired by Relius: "Curse you Nine, it seems to have begun. The Embryo will soon come to life. I must go as well, to prepare for the coming events." Relius says the vessel won't last much longer since she's been abusing it so much. Izanami asks if there's another vessel. Relius says it's a miracle even this vessel can contain her. The model for Saya was "No. 5", a huge irregularity. Relius wished to analyze it more, but Jubei destroyed it. Izanami asks how her body was created. Relius says Prime Field Device creation is not set in stone and varies between creators. Concerning Materials: For the female side, a human can be used as the base or it can be built completely artificially like the dolls. (The dolls Relius makes are affixed with a soul.) For the male side, in other words the father of the artificial body, the catalyst is the Black Beast. Izanami says it's ironic she's also a child of the Black Beast. Relius says it's not really a child... while production methods differ, it involves breeding the female with the Black Beast. Izanami's body is no exception. Other prime field devices were based off of it as either backups or research materials. Relius confirms Ragna and Jin could be called the "children" of "No. 5." "No. 5" was not Relius's creation, someone else made it based on his research. And Ayatsuki taught Relius how to create a body that could contain even a god. Relius says that decades ago... no, hundreds of years ago considering the current time, there was a girl who took the same form as Izanami's vessel. She could amplify Seithr indefinitely, devouring the souls of humans, and taking their power for her own. She was ultimately defeated by her own "brother"... or more accurately consumed. Relius still remembers that beautiful sight. No.5 is a duplicate of that monster, so perfect you could call it the real thing, and Relius wishes he knew how it was created. Izanami says she must go because now that Nine has made her move, the qualified will come to defeat her. Izanami says Relius, as a qualified, should come too. Relius wants to find out why the "Man of Azure" is in the Embryo. If the "Man of Azure" has awakened the true grimoire, the "Azure Flame Grimoire", it would be enjoyable to watch him defeat "Hades." Izanami sighs and says the monster continues to witness a dream where it will never be saved. It's too late for Ragna. This time, the time setting is Chrono Phantasma. Makoto, Carl, Kagura, Tager, Tsubaki, Litchi, Hakumen and the other qualified all get a message from Nine that they must kill Izanami to make their dreams reality. Substory: Kokonoe wonders what's going on. Substory: Es says "she" already perceived the Gate. If "she" perceives it again, the Gate could open. Es, the Azure Guardian, must prevent this. Jin and Trinity talk about Nine's announcement. Jin remarks how amazing this Intervention was because it was targetted on the world itself. Jin wonders how she did it. Trinity wants to find Kokonoe to find out if "something that shouldn't exist" is here. Jin reluctantly agrees and thinks they should head for Kagura's offices. Celica and Naoto heard Nine's voice. Naoto is disturbed she told everyone to murder someone. Celica is disturbed by Nine's tone and runs off to find her. Naoto tags along to learn more about the Azure. Substory: Valkenhayn arrives to bring Rachel back to the castle, but Rachel wants to help Ragna reach his goals. Valkenhayn agrees to support her. They need to walk, Rachel can no longer teleport. Rachel asks Valkenhayn to gather information about the qualified. Substory: Tager encounters Arakune. Kokonoe reads him as a Nox Nyctores with a highly compressed ball of Seithr in him. He's more powerful than Tager, so Tager retreats. Arakune seeks Nox Nyctores and the Azure. Childhood Flashback: Ragna and Saya are gathering food. Saya is attacked by a wolf (I think it's probably a remnant) and there's a huge explosion. Ranga says something black surrounded Saya and destroyed the wolf. Celica is amazed Saya did this with so little Seithr. Substory: Nine says that if all the Nox Nyctores are gathered, she can make Take-Mikazuchi whole again. It should be able to knock away Tsukuyomi and destroy the Master Unit. Relius will use Nu to search for the Causality Weapons. Nine says that for now, she'll properly listen to Ten Sage One. Relius says that was a long time ago and he ceased being One before Nine took her seat. An injured Ragna arrives in Ikaruga. He needs to find Saya. He remembers Jubei said she was a grimoire in the form of a human. He doesn't know what that means or who Izanami is. Bang arrives to help Ragna get medical help. Noel wakes up in a room. Mai comes in and says she's glad Noel is back up. Mai says it must have been magic that moved them both here to Ikaruga. Mai was in the eastern part of the continent. Noel asks what happened to Mai after school. Mai said a lot of things... she even worked for Sector Seven. Mai says it's been tough without Noel's food. Even Kokonoe couldn't cure her super taste. She's so happy to get Noel's cooking again. Substory: Litchi meets Relius. He says it's interesting she's using Lao Jiu to retrieve herself from the Boundary. Relius tells her she's on a path of self destruction, then leaves. Bang and Ragna chat around a campfire. Ragna reveals his name now that he remembers and thanks Bang for helping him again. Ragna has autohealed. Ragna wants to know about the Ikaruga War. Bang says 6 cities made up the Federation and seceeded from the NOL. The Federation took Homura, son of Imperator Tenjo, hostage and the war grew from there. Bang was Tenjo's head ninja (for the Library) and fought to save Homura. The war continued for 6 years. Tenjo died at the same time of the "NOL attack" that destroyed the Ikaruga capital Ibukido. No one knows why Tenjo died, but this allowed Kagura to broker peace. Bang can't forgive Kagura and himself for not being there for Tenjo. After Kagura made peace, the sides allied and Homura became the new Imperator. Bang wants to erase that war, so is hunting Izanami like the voice said. Ragna didn't hear the voice. Ragna inspects the Rettenjo and is alarmed that it's the real thing. Why's it back here and not in the Cauldron? Substory: Tager encounters Hakumen. Kokonoe wants to know why he's here. She also wants to verify that the information of her backup in the Boundary that said she salvaged him is accurate. Hakumen won't help her. Kokonoe tells Tager to apprehend Hakumen. Hakumen asks how long Tager will be a random puppet, allowing everyone to walk all over him and mess with his memories. Tager wonders about his forgotten past as Hakumen leaves. Hazama and Terumi, still unfused, chat. Terumi says Izanami has the Azure and that might be able to allow them to fuse. Hazama asks about the scar on his stomach. Terumi says that happened before the Embryo, but the thing that caused that scar makes it hard for them to fuse now. So now Hazama must touch the Azure for them to fuse. Terumi says they need to find Noel first. Substory: Mu arrives at the Gate. Es says she must not understand what it is and attacks. Because Mu is incomplete, Es easily wins. Mu wonders if Es is a Prime Field Device too. Tsubaki is looking for Jin and thinking about Nine's announcement. Only one qualified can fulfill their dream. Makoto finds Tsubaki. Tsubaki decides to attack the other qualified in order to make Jin's dream come true. Tsubaki starts with Makoto, against Makoto's wishes. Tsubaki gets flashes of fighting Makoto before and stops fighting. Makoto leaves. Substory: Tsubaki is conflicted about whether she really wants to fight her friends to make her dreams come true. Tao comes. She teases Tsubaki and announces she's here to beat up bad people, especially the one with a bad smell. Then Tao runs off. Tsubaki says she must decide what is evil and what is justice. Platinum is looking for the Azure and Izanami to make her dream of a happy life with Jubei come true. Nu attacks to get Muchorin, but Platinum escapes without even trying very hard. Luna and Sena can't remember their names anymore and become even more transparent. They decide the Azure can fix this problem too. Ragna and Bang are in Akitsu. Ragna wonders why the Cauldron isn't opened after what happened in Chrono Phantasma. Ragna leaves Bang. Ragna feels nostalgic returning to the Akitsu Cauldron, remembering when he hunted the world to destroy the things being smelted in the Cauldrons. Flashback to training days: Jubei says it's possible for Ragna to destroy the Library, but impossible to save Saya. Saya isn't herself anymore, something else took her over. Jubei and Ragna take down a Cauldron. Jubei explains Saya is a Prime Field Device, the base for the thing in the coffin in front of them. Jubei has been spending his time stopping Murakumo Units from being smelted. Relius meets Ragna. Ragna asks Relius questions, but Relius ignores him. So Ragna attacks. Relius says Ragna is interesting and that he must defeat Izanami. He tells Ragna that Izanami is in the ruins of Ibukido, at the foot of Amaterasu. Relius leaves. Substory: Azrael breaks his way into where Izanami is. She says even though the Embryo and Azrael's prison float about in the same dimension, it's amazing he tore his way into here. Azrael and Izanami fight. Azrael can't kill her because Izanami is death incarnate. Azrael is bored fighting her because she has no life. He desires endless battle. That amuses Izanami, who asks him to make a contract with her to defeat the qualified and release the Embryo. As payment, she'll open the door to gods that Azrael can fight. Azrael happily agrees. Kokonoe and Kagura talk. By observing Seithr readings, she deduces Ragna, Celica, and Hakumen are here. Hibiki says Noel was located and Kagura rushes off to find her. Noel and Mai encounter Hazama. Hazama says he's here to arrest Noel for breaking into the Kagutsuchi Cauldron and aiding Ragna. Mai tries to fight him, but Hazama easily overpowers her. Kagura saves them and says he didn't hear any order to arrest Noel. Hazama says it's because he would have helped Noel escaped. Kagura says Hazama shouldn't attack Duodecim members like Mai Hazuki. Hazama says even if she's a Hazuki, it doesn't matter, the Duodecim holds little sway nowadays. Kagura insists he'll protect Noel. Hazama leaves. Substory: Nu fights Bang for his Rettenjo. Bang holds his own, but Nine comes to retrieve it herself. She says he should just hand it over because Tenjo's soul isn't there anyway. But Bang defends it just because it was entrusted to him. Overpowered, Bang runs away. He runs into Tao, who says she'll bring him somewhere safe. Celica and Naoto finally make it to the city. They talk about Nine. Naoto bumps into someone and then loses Celica. Substory: Arakune tries to eat Nu, but Relius saves her. He lets Arakune escape. Relius is interested that Nu also wants the Nox Nyctores. Naoto thinks he sees the girl he's looking for and runs after her. It's Rachel, but Naoto addresses her as Raquel. Rachel thinks Naoto is Ragna at first. Rachel learns Naoto comes from another world and is concerned that Ragna could be erased by him. Rachel pre-emptively attacks Naoto. Naoto activates his Drive, making Rachel ask how he can be using that Drive. Naoto tells her to answer his questions. Rachel says Naoto has to leave because Naoto and Ragna are the same existence. This makes Ragna's existence here less stable. Valkenhayn jumps in to protect Rachel. Valkenhayn and Naoto recognize each other, confusing both of them: Valkenhayn knew Naoto from long ago; Naoto thought he was in an alternate world. Naoto suddenly is teleported away. Substory: Taokaka meets Torakaka. Tao says she wants their village to be happy, but since it's already happy, so Tao will just go beat up bad guys. Tao decides she doesn't need the Azure. Naoto is at the Gate and meets Es. Es knows who he is and attacks him. She's strong. There is a distortion. Before Naoto is taken away, he asks where Raquel is. Es says that she has always been by his side. Substory: Bullet apologizes to Tager for not taking care of Arakune earlier and letting Tager get injured later. Bullet runs off in search of Arakune. Bullet wants to be recognized by Tager as a warrior and has a brief flash of the Nirvana operation. Celica looks for Naoto, but runs into Carl. Carl doesn't remember Celica and insists that Nirvana isn't his sister. He says his sister is sick and he needs the Azure to cure her. Celica asks Carl to remember about Nirvana. Carl runs away as his memories return. Kagura brings Noel and Mai to Kokonoe. They discuss the "memory problems." Kokonoe suspects their memories and the world were rewritten. Kokonoe says that Nine told them to take the Azure from Izanami, but Ragna also has the Azure. Noel freaks out over the thought of what she started to see in the Black Beast and says she can't let Ragna and Izanami meet. Substory: Valkenhayn meets with Hakumen. Hakumen intends to kill god, since she's evil. He suggests that Valkenhayn decide the best way to express his loyalty to Rachel. Ragna is lost and runs into Rachel. Rachel tells him not to seek Izanami because of what happened last time (I assume in Chrono Phantasma.) Rachel confirms they are inside the Embryo. She says the outside world was absorbed into the Embryo. This world was created to capture the Master Unit. The only way to get out is for one of the qualified to defeat Izanami and make a new world. Otherwise, all of existence will be stuck in the Embryo forever, which is probably Izanami's plan. Ragna wants to know why Nine and Relius told him to defeat Izanami. Before Rachel can answer, Azrael attacks. Ragna matches Azrael without BlazBlue, which thrills Azrael who sees the day coming where he can use his full strength. Azrael wants to fight Ragna when Ragna reaches his full potential. Ragna gets teleported away. Ragna fights Izanami. Izanami tricks Ragna into killing her. A Intervention starts because "she" doesn't like this conclusion. Ragna looks into Izanami's eyes and a sees a crucified girl in the darkness who Izanami identifies as Amaterasu. Izanami is that girl's Drive, so can not be killed. She is Izanami, the opposite existence to Amaterasu's power of creation, the "Izanagi System." As long as the original does not vanish, the world will continue to reflect her dream, God's dream, the "Central Fiction" that can never be awoken from. If Ragna wishes to save Hades Izanami, then he must first end the girl's dream: the dream of the original Noel Vermillion. Flashback: Researchers discovers the Susano'o Unit, sees it's resonating with something, and realizes a greater Unit (that they call God) exists. They send a crucified girl into the Cauldron to contact it. They've finally found a world with no hate, no conflict... only eternal peace. A perfect world. They ask the girl to fulfill the dream of humanity. Ragna says they're just forcing their desires on a young girl. Finding the Master Unit is what closed the possibilites of the world. No matter how hard you wish, nobody's dreams are fulfilled, leaving only despair. Then he realizes this must be wrong because one person's dream should be fulfilled. Ragna thinks that the Black Beast is the "dream" being fulfilled... a world of no hate, no conflict, and eternal peace because the Black Beast destroys all of existence. Ragna thinks, "So this is my end." A hand reaches to help Ragna and a voice encourages him not to give up because he has the Azure. Ragna wakes up with Hazama in a place that looks like the top of the Kagutsuchi cathedral. Hazama says this place is a "forsaken event", a space between dimensions with no possibilities. Ragna contemplates this is what humanity caused by using the Master Unit and what the end of the world looks like. Hazama says he doesn't know why he's still alive. After Trinity pulled Terumi out, she should have stabbed and killed Hazama. Instead, she let him live, maybe because he looks like her old friend. But now he can act independently. Ragna asks what Hazama's dream is. Hazama says Terumi feeds off pain and sorrow, but Hazama can't feel pain, either the pain of his own or of others. Hazama shows Ragna a gaping hole on his chest. He says the wound Trinity gave him when she stabbed him throbs and he can feel it. That pain makes him feel self-aware and independent. Hazama says, "My dream is to know." He wants to know the pain and suffering of others. Hazama says he needs to get some things to do this and he'll need Ragna's help. Hazama brings out Mu and says he found her, but she's annoyingly incomplete. She's his heart, like Nu is Ragna's heart. Hazama, as an Azure Grimoire himself, wants to become the "Black Beast"... no... the "Azure Flame Grimoire." In order for Hazama to do this, Ragna will need to teach him more pain and suffering. Ragna and Mu briefly fight, but Ragna successfully gets her to wake up. Ragna is confused why she and Noel both exist. Mu says she was detached from the Noel Ragna has been interacting with. They try to use the cocoon to return to their world. (The cocoon has the same functions as the cauldron used to smelt Mu.) Only Ragna makes it. Mu's voice says she might be able to come back if Noel is brought near a Cauldron. Substory: Carl has his memories back. He isn't sure the best path for bringing back his sister, so decides to ask Relius. Substory: Litchi travels to Akitsu. She gets her memories back and tries to open the Cauldron so she can talk with Arakune. Tager stops her. Litchi tells Tager Arakune is a vessel, Roy's soul is still sleeping deep within the Boundary. Litchi intends to get Roy's soul. She won't let Tager stop her and says he has his own work to do. Hazama tells Terumi everything is going according to plan and Ragna is back in this event. Substory: Kokonoe has her memories back and sorts out her problems and says she needs to find "that man." Substory: Bullet gets her memories back. Azrael finds her. Azrael remembers defeating her mercencary group and how resilient they were. He calls her captain a coward for running away before Azrael reached him. Azrael easily beats Bullet. He's so disgusted he doesn't kill her and just leaves her to die on her own. Bullet wonders if Azrael told the truth. Ragna heads to find Noel at HQ. Celica finds him first. Ragna says they can't travel together because Ragna is a wanted man. Celica says she can go bring Noel to him, so Ragna won't have to go near Kagura and Kokonoe, who are probably hunting him. Ragna asks what Celica's dream is, she says it's for everyone to be happy. Ragna is lost because the layout of this world is all wonky, but they somehow find Yabiko. Celica goes to the branch alone, with Minerva leading the way so she doesn't get lost. Substory: Jin finds an almost vanished Platinum. He says the world doesn't recognize them, so they were fading. He "perceives" them using the Power of Order and they become solid again and get their memories back. Using the Muchorin, they can give Trinity a temporary body. Hibiki brings Celica to Kagura. Substory: Naoto approaches Ragna and asks if he knows where Celica went. They immediately bicker and end up fighting. Ragna says the longer he fights, the worse he feels, like he's fighting his own shadow. They're confused they both use the same Drive and have a little sister named Saya. Naoto says he doesn't have time for this and runs away. Kokonoe and Kagura have their memories back. Kokonoe explains teleporters don't work because the world changes depending on who is viewing it. Kokonoe learns Celica wasn't affected by the Embryo. Kokonoe says Ragna can't be allowed to wander free. Kokonoe tasks Tager with capturing Ragna, but Celica tells Tager not to do it. Kokonoe sends Makoto and Tsubaki to capture Ragna too. Kokonoe says that Ragna can not be allowed to protect Noel. Celica is locked up. Substory: Carl finds Ayatsuki's notes and wonders how Relius Clover was alive in 2098. He is determined to get more knowledge. Makoto meets Ragna and is ordered to apprehend him. Ragna verifies that the qualified can detect other qualified. They briefly fight. Makoto suggests that Ragna escape before Kagura and Tager arrive. She tells him to protect Noel and assures Ragna that no other qualified have died yet. Ragna wonders if Makoto will get a new dream. Ragna randomly decides to go to Wadatsumi to try to find Noel. He encounters Tsubaki and she verifies that he's Jin's older brother. Tsubaki wants to kill him to sever Jin's bonds that would prevent him from leading the world. Ragna beats her. He addresses Kagura who was secretly watching. Kagura wants to protect the plan he's executed up until now. He wants to protect Noel and knows that Ragna intends to use her for something. They fight. Kagura is amazed at Ragna's current strength. Ragna says Kagura seems as strong as Azrael. Ragna is suddenly teleported away, but not by Nine or Rachel. Kokonoe asks Kagura about his dream, but Kagura doesn't know what she's talking about. Rachel watches Ragna with sadness because of the tough path he's chosen. Ragna is teleported to Kushinada's Lynchpin by Amane. Amane says Ragna planned to use Soul Eater to speak to Tenjo in the Lynchpin. Amane won't let him and they fight. Amane is strong. Amane says he wants to Observe Ragna and prevent him from becoming the Black Beast and destroying this young world. Ragna refuses. Ragna says it's a closed path, just repeating what happened before. One person will futilely try to force their dream on everyone else. Ragna intends to deny everyone's dream and open up a new possibility. He'll play his role as the Grim Reaper, "Ragna the Bloodedge." Amane is amused and encourages Ragna. He tells Ragna to search for the Gate that connects to the Azure. Substory: Platinum, Jin, and Trinity are in some facility. Platinum says they don't like it and Trinity says it's probably because they were experimented on in a place like this. Platinum gives Trinity form so she can activate the facility. She explains Jubei found Luna and Sena during one of his Cauldron destruction trips. Their bodies were damaged to the point where they could no longer house their souls. At this point, Jubei had the Muchorin (and thereby Trinity) and he had found an unused vessel in another facility. They planned to use the vessel for Trinity, but decided to give it to Luna and Sena instead. Substory: Trinity is about to make a proper vessel for Luna and Sena so they can properly exist in the Embryo. Carl pops up and says he wants to know more about this process. He volunteers to help them. Ragna is back in Wadatsumi. Rachel is there and says it's reckless to be devouring the dreams of everyone else. His task is impossible... if he's alone. Rachel is too weak to help, but she suggests he asks those around him. Ragna turns down her suggesstion. Rachel knows it's useless to force him and starts to plan for helping him out once he's struggled enough to accept her advice. Ragna meets Bang. Bang thinks it's wrong to kill Noel for fulfilling one's dream and refuses to let Ragna use Noel for whatever he wants to use her for. They fight. Ragna verifies that Bang is not after Noel and tells Bang to let him know if he sees Noel. Ragna promises he's not after her life and that she asked him to find her. Bang realizes he's forgotten his dream. Ragna's arm feels heavier the more dreams he devours. He meets, fights, and devours Bullet's dream. Bullet doesn't know why she can't remember her dream. Ragna says it's because he devoured it so he can turn it into a possibility. There's a sudden phenomena intervention. Ragna is back to Kaka Village when he was being healed by Litchi. He asks who the Hero of Ikaruga is, she answers Jin. Ragna mutters that the possibility is being closed. He asks for her dream: It's to return Roy to normal and reclaim the time that she cherished. Ragna fights her and devours her dream. Ragna is consciously suppressing the Black Beast now. Ragna remembers that Amane said as he takes on the weight of dreams, he'll lose himself. Ragna goes into the sewers and fights Arakune. There's another phenomena intervention. Ragna asks what Noel doesn't like about what Ragna is doing. He swears to never give up and to end this nightmare. Substory: Platinum's body is now at full strength. They just need to somehow find Jubei now. Jubei abruptly jumps in, but says it was just a coincidence he found them. Jubei says Kokonoe is trying to enter Nine's workshop. They suspect an 11th Nox Nyctores is being held there and he needs help to destroy it. Jin and Trinity agree to help. Rachel, Kagura, and Kokonoe meet Ragna when he appears in Ikaruga. Kokonoe says they predicted he would appear here. Rachel asks if he realizes he can't do this alone yet. Ragna says he can't cooperate with people who want to capture him. Kagura says Rachel explained everything: Ragna won't let someone's dream fixate the world, instead he'll gather all those thoughts to give the world multiple possibilities. He's collecting dreams using the Soul Eater. Kagura likes this solution that doesn't involve sacrificing Noel. Substory: Platinum is to be left in Kaka Village. But first, they want her to materialize "Hihirokane." It's a special blade that cuts the spirit, rather than the body. The real Hihirokane is at the Alucard Castle and was sealed away by Clavis. Jubei wants Platinum to materialize Hihirokane using Jubei's right eye (which belonged to his younger brother, who used Hihirokane) as an intermediary. Platinum is determined to create the sword in order to help protect Jubei. Ragna won't let Celica try to heal him. Ragna and Kokonoe go off into her lab. She says Ragna's theory of unqualifying the qualified by removing their dreams is solid, but he doesn't have the capacity. Ragna actually believes his capacity for Seithr is bigger than normal because he wasn't born with a Drive. Kokonoe asks if Ragna can stand up to Izanami in his condition. Ragna is using the Idea Engine's full capacity just to keep the overflowing Seithr in him at bay. Ragna asks about Celica. Kokonoe doesn't know why she still exists at all and says that if she uses magic, she could instantly vanish. Kokonoe and Kagura have been hiding Noel. They have a discussion with Rachel and Ragna. Noel's memories are still distorted. Kokonoe says their memories were distorted in the Embryo, but the moment the Master Unit appeared, they came together. Noel wasn't affected... probably because the world is constructed from Noel's desires. Based on their research, Kagura and Kokonoe think the source of the first phenomena intervention (by the Master Unit) was different from the two others. Kokonoe read Nine's documents. After the Dark War, Nine was working on an 11th Nox Nyctores, a new god, to escape the Master Unit's observation. She got thrown into the Boundary before she could complete it. But Izanami pulled Nine out of the Boundary and now Nine is about to activate "Corpus Sepulcro: Requiem." Kokonoe wants Ragna's help to destroy the core of the 11th Nox Nyctores. Ragna thinks it'll be hard with Nine defending it, but Kokonoe says Nine doesn't have it. Kokonoe built the Sector Seven facility on top of Nine's workshop, where the 11th Nox Nyctores still resides, in order to seal it. Kokonoe has never entered it. Sector Seven is in Japan at the place where the Black Beast first appeared. Nine's Japanese workshop was her father's workshop. Tager will be ready with a working teleporter tomorrow morning. After that, they just need to pry open the workshop, use BlazBlue, and put Requirem out of action. Jin and Jubei arrive to help. Kokonoe doesn't want Jubei's help. Ragna is shocked to learn Kokonoe is Jubei's father. Jubei investigated and says the only way to get into the workshop is with the key. The key is: Immense magic power, the blood of Nine, and the technique to combine the two into a key. Kokonoe knows her blood doesn't qualify because she's a Grimalkin (half beast.) But Celica's blood will work. Kokonoe doesn't know how to make the key. Jubei says the key needs to be created with Alchemy. Trinity is here to do that part. Kokonoe wants to know what they'll do if they still can't create the key. Jubei says he'll use Musashi. Kagura says he'll stay behind to support Homura in running the cities. Substory: Hazama reports that he met Izanami and contacted the Azure in her possession. Hazama says he "Reclaimed" it and they can fuse. Hazama says he was waiting for the moment Terumi was this weak, but Terumi still has interesting powers Hazama doesn't have. Hazama wants to control their combined body this time, which amuses Terumi. Terumi agrees. Substory: Bullet finds Tager and asks who he was. She finds records that he was remodelled on the day Bullet's unit was wiped out. Before he was remodelled he requested his existence to remain hidden. Tager says he has no memories, so he can't answer Bullet's questions. But he guesses. Based off the last time he fought Azrael, Tager assumes he fought Azrael before. Tager was probably Bullet's captain and was so ashamed that he survived the battle with Azrael that he asked for his memories to be wiped. His sin was wanting to run away, but Bullet said his sin was really not being willing to share his pain. Bullet has found her captain and wants to show him how strong she's become. They fight. Tager says she's strong and Bullet is happy. Bullet leaves to walk her own path, no longer burdened by the past. Noel thinks about how crazy the current situation is in her room. Ragna asks her to come with him (flustering her a little.) Noel's dream is to have a happy normal life. Ragna doesn't say denied, he says he hope it comes true. They go to a restricted area, the Cauldron in Yabiko. Mu tries to merge with Noel, but Noel rejects her and passes out. Mu says she saw a large gate when trying to merge. Ragna gives up on the merge for now. They teleport to Sector Seven. Ragna mentions the Cauldron here is huge, Kokonoe says that's why everyone wanted to use it. The workshop is in the Cauldron. Jubei guards the entrance to the Cauldron. As soon as the rest of the groups leaves, Jubei tells the hidden Nine that it's time to settle things. Substory: Mai is tasked with protecting Homura so he can lead the world after the world ends. Substory: Bang and Tao come under Tager's suggestion that they help Litchi find Arakune. Litchi learns Tao can find Arakune by scent. Litchi explains that Arakune is a "gate" to Roy's will. Roy's will is floating in the Boundary. Arakune is a "container" to fasten his soul. Lao Jiu helped Litchi regain memories from a previous event. Arakune attacks them. Litchi asks Bang to let her handle Arakune. Litchi fights Arakune. Arakune starts absorbing Seithr to become a Black Beast. Against Bang and Tao's wishes, she jumps into Arakune. She finally finds Roy, but he refuses to come with her because he wants to continue studying the Boundary. He says theirs is a battle a selfish wills. He is glad Kokonoe was Observing Arakune because it allows Roy's soul to exist in the Boundary. But he wants to stay here to satisfy his curiosity as a scientist... he can learn everything about the world. He tells Litchi to go back to the people who need her and walk her own path. Roy wants to sever all ties and immerse himself in research here forever, even if no one ever reads it. He asks Litchi to destroy his vessel. Litchi pops out of Arakune and intends to destroy Arakune. Bang knocks her out so he can do it in her place, so she doesn't have to sully her hands killing her loved one. Tao takes Litchi away while Bang fights. Bang is about to finish off Arakune when the disqualified Chosen start turning into Seithr. Litchi and Tao vanish. Arakune vanishes. Carl meets with Relius. Carl says he wants to learn everything Relius knows. Carl disagrees with his father about the usefulness of unstable souls. Relius is amused. They get to the lab and don't need a key to enter. They learn that space is compressed. Kokonoe finds another key just by perceiving it, something she can apparently do as Nine's daughter. This uncompresses the space. Requiem is visible... it looks like Take-Mikazuchi with thirteen coffins labelled I-XIII circling it. Requiem was Nine's attempt to create a Master Unit. Jubei is suddenly thrown into the room by Nine. Nine opened the door for them earlier, making things easier. Ragna asks what Requiem is for and why she wants to destroy the world she protected. Nine says she doesn't want to destroy the world, she wants to continue protecting it. Nine wants to end this worthless lie of a world and Rachel says Nine must have seen "it." Celica asks what happened after the war to make Nine like this. Nine tells the story of what she saw, the girl who would become this world's God. Nine fought desparately in the Dark War, partly because she saw it as her father's fault. After the war, Nine wanted to know why it was fought. Everything seemed too convenient to Nine. Even as a genius, Nine invented Ars Magus way too fast. She finally learned there was a war in the "distant past" where Seithr was also used. The "Prime Field War." Relius tells Carl about the "Prime Field War." It was a war between humanity and the Prime Field Devices. It started with humanity finding the Master Unit. They saw the Master Unit as an object that could be controlled. Takamagahara was built, but it was flawed. It could perform interventions to rewind the flow of time, but could not intervene on the "possibilities" that compose the world. Even if it rewound time, the exact same events would happen. To figure out what their system was missing, humanity attempted to contact the Master Unit. So humanity explored the Boundary and found the Master Unit only responded to objects in "human form," which led to the creation of the Boundary Interface Prime Field Devices. The "First Prime Field Device" successfully made contact with the Master Unit and became its "eye"... it gained the power of an Observer. Whatever an Observer sees is made reality. The power of the "eye" (the Azure) is what was missing from Takamagahara. But along with the "eye", the Prime Field Devices also gained "souls" and became self-aware, so humanity destroyed them and threw them back in the Boundary to prevent them from intervening on their world. The First Prime Field Device, "The Origin", managed to contact the Master Unit again after being thrown away. Nine continues. "The Origin" saw the plight of her sisters: The cruel experimentation done on the other Prime Field Devices. This started the war. Even though the Devices were far outnumbered, with Intervention and their built-in combat abilities, the war was in their favor. To oppose the Master Unit, humans prepared special equipment that wasn't affected by phenomena intervention. They used these to destroy the "eyes." Nine says this was convenient. She wonders how they could have predicted exactly what would happen and give them the right suggestions. Rachel mutters "...Father." So humanity staved off phenomena intervention with Izayoi, but there was a limit. "That" wasn't enough to neutralize Prime Field Devices either. Humanity used a "certain something" to mass produce a "self-observing" weapon of mass slaughter, based off the techniques used to create Izayoi. Celica interrupts. She wants to know who started the war. Nine says it was the humans who started the genocide out of fear because the Prime Field Devices with souls had a dream: They wanted to be recognized as humans. Humans were scared because the Devices had greater physical abilities than humans and The Origin had the power of god. Human creations gained souls and started asserting self awareness. Humanity, and that "scum", used countless humans as a catalyst to create an insane weapon of mass slaughter to destroy the Prime Field Devices: The Black Beast. Take-Mikazuchi is based off of this. Even today people still try to create Black Beasts, like in Ibukido. It's easier to create the uncontrollable Black Beast than the controllable Take-Mikazuchi. The Black Beast during the Prime Field War rampaged and ended the world. Relius continues. All humanity needed to do was win. If they could complete the Takamagahara System with the Azure and win the war, they could use the Takamagahara System to rewind time and prevent the war from happening. After all, the Takamagahara System was built to ensure the existence of humanity. But on the verge of obtaining the Azure... a miscalculation in the system occurred. Nine continues. The Origin started "rebuilding" the world. The Takamagahara System was acting to prevent the Master Unit from redoing the war, but The Origin actually had an unpredicted desire. It just yearned to exist, yearned for a human world. Relius continues. It used the Takamagahara System to accomplish this because although the form was different, the desire was the same. The vessel used to rebuild the world was the Embryo and due to war, there was more than enough Seithr to make it. In other words, the world that existed up till now was based off information from the world that was destroyed before. Nine finishes. The Origin used the Master Unit Amaterasu to rebuild the world. This world itself is "Central Fiction." The world is made to repeat the same history over and over, up to Kagutsuchi. Nine doesn't know why The Origin wants this. Every time The Origin doesn't like the ending, the world is consumed by the Black Beast again and then the world is reset to the horrible Dark War. Nine hates everyone being used like this, endlessly reliving tragedies and gruesome ends. She wants to protect Celica, her friends, and loved ones. She wants their hard work to mean something and make a difference. But they have to keep repeating their performance for some little lady napping in a fancy piece of junk. Nine doesn't care about Celica's approval in this one instance she can't forgive. The world is repeating forever for the sake of fulfilling only one person's dream. Nine wants to end this dream, rewind back to "that time", and stand up a new world that isn't based on the will and dreams of another. She's creating a god with a perfect system that will prevent someone else from intervening so that anyone's dream can come true. No one approves of Nine's plan to deny the present (by rewinding time.) Ragna stands to fight and stop her. He says she's not the Nine he knows. He understands her dream more than anyone else, which is why he has to stop her. They fight. Nine is winning, but gets distracted when she sees Celica and remembers Celica as a child. Ragna deals a killing blow and devours her dream in that moment. Substory: Carl is alarmed the things he creates with Ars Magus is really the same as God's creation of humans. Relius says that's right. If this world is the creation of The Origin, then the original world was the creation of the Master Unit. Carl wants proof and Relius tells him to find it himself. Celica cries over Nine. Nine tells Celica to follow her own path, like Nine did. She says she can't forgive Noel, even though she's not doing this intentionally. She tells Ragna she'll be watching his dream from the other side and hopes it comes true. She asks Jubei if she's become naive again. Jubei asks her to wait for him on the other side and she promises to wait. Izanami appears and says it won't happen, she'll send Nine to an empty, eternal nothingness. Izanami says Nine is pathetic, that one who exists out of reason and was qualified should have been able to defeat the demon. Celica tries to protect Nine. Nine stands up, intending to oppose Izanami to protect the ones she loves around her. She uses the "Radiance of Extinguishment" that Izanami detests. Everyone tries to protect Nine, but Nine tells them to stand back. Izanami performs a death strike, but there's a sudden phenomena intervention. Nine says she predicted Izanami's arrival and planned to kill her using Requiem. Even though it's incomplete, Nine activated it. She uses a binding spell that even Izanami can't break for a few minutes. Nine says Doomsday can't be stopped as long as Izanami exists. Nine intends to use Requiem to freeze time in this room to stave off Doomsday. She can only stop Izanami for a week. Ragna promises to find a way to save Izanami in that week. And he promises to save Nine too. Nine says it's impossible... the catalyst for starting Requium was Nine's life. Nine has no regrets, she lived true to her beliefs. But she's willing to bet on Ragna for a little bit. Nine says they have to escape. Nu suddenly shows up to kill Nine, but Jubei stops her. He says he'll hold off Nu while Ragna escapes. Nine dies, happy that she could experience Jubei protecting her again. Kokonoe can't teleport them out. Izanami promises them death after the time freeze ends. Celica wants to protect everyone and teleports them out. Hazama is surprised Ragna beat Nine. Terumi is disappointed he didn't get to kill her again. Hazama says they need to kill Celica next, but Terumi says he should worry more about Trinity. The survivors arrive at Celica's church. Ragna and Jin can't understand why it's not burned down. Celica is unconscious. They decide to bring her inside. Kokonoe leaves because something bothers her. She tells Rachel to contact her if something happens with Celica or Noel. She tells Rachel this is unmistakably "that" church. Ragna and Jin know this is their childhood church. They wonder why it exists here. Substory: Kokonoe decides she needs to find Naoto in order to figure out how to teleport back to Japan. Childhood Flashback: Someone told Saya to give Yukianesa to Jin, so she does. Jin takes it just to placate Saya. Ragna wakes up to the Sister scolding him for not coming to the garden like he promised. Saya is apparently sick. Ragna has the Sister finally admit that Ragna has grown up. She says he reminds her much more of a man she once knew. Yukianesa tells Jin to: "destroy, cut, the church, barrier." Ragna comes back to the church burning. Substory: Kokonoe finds Naoto. She knows he's from another world or event, but can't figure out where. Naoto says his world is gone, but he was told to "save possibility and save the world." Naoto asks Kokonoe to help him save this world. Kokonoe says that if Naoto's world vanished, she has a similar hypothesis to another precedent. Kokonoe wants Naoto's help to verify her hypothesis, but Naoto runs away. Kokonoe decides to ask "her" to collect Naoto. Noel wakes Ragna up from his nightmare. She says she and Celica are about to cook breakfast. Ragna is concerned about Noel's cooking. Rachel and Jin went off to do their own things. Jin gets back. Noel does lots of things to suggest she has Saya's memories. Rachel finds Jin and Ragna and tells them "that" is under the church. She says it can serve as the Cauldron's replacement for Ragna's plan with Noel. Jin, Rachel, Trinity, and Ragna decide their best course of action for now is to recover at the church. Ragna asks Noel to come with him and meet Rachel. They meet. Rachel says they're going beneath the church to visit the remains of the Black Beast. Ragna says he wants Noel and Mu to try to fuse again. Noel agrees to try, even though she's scared. The decapitated Black Beast corpse is in front of them. Ragna explains that like a Cauldron, the Black Beast's remains are concentrated Seithr. Noel and Mu merge. Noel's memories return. Noel remembers seeing the Gate. It shouldn't be touched or opened. If the Gate is opened, all possibility will end. That's why Noel separated herself. Noel tells Rachel and Ragna she has all her memories. She reveals she's Hades Izanami too. And the soul of Saya is in her too. Celica summons them because Tager arrived. Tager is setting up the transporter, they can teleport tomorrow. Then they'll scheme on how to destroy Requiem and Izanami. Kokonoe plans to use Minerva, whose power source is a miniaturized reactive furnace. Requiem is out of control and will explode as soon as time starts again. Izanami, Murakumo, and Jubei are in that space. If Requiem explodes, it will destroy the world, so Kokonoe hopes Minerva exploding will cancel out Requiem exploding. Ragna is opposed to destroying Minerva, but Celica says it's okay. Noel has an idea for dealing with Izanami. They'll discuss it later. Jin asks what Trinity wants to do. She asks to stay with Jin so she can stop Terumi if he shows up. Jin is okay with that as long as Trinity doesn't interfere with him. Trinity says those in the present should determine the future. Rachel says Celica used a ton of magic restoring Rachel enough to teleport everyone out. Celica could vanish at any time. Celica comes out and Rachel leaves. Celica says she loves the world and hopes Ragna can save it. She tells Ragna she always believed in him and always will. Substory: Hazama reports that all players will be gathering in one place soon. He says that the thing Terumi wants, Noel, will be there too. Terumi says he wants something else too, but it may not be there. He separates from Hazama and says it looks like they won't be fusing after all. Terumi was able to obtain Hihirokane from Alucard Castle. Terumi just used it to cut their spirits and sever their connection. Hazama guesses that Hihirokane will be useful for allowing Terumi to get a new vessel too. Terumi says Hazama should be glad Terumi freed him. Then Terumi consumes Hihirokane and heads off. Substory: To save Jubei, Platinum gives the Hihirokane she made to Hakumen. Hakumen won't let Platinum come with him because they're exhausted from forming such a high level item. The teleporter is ready. As they leave, Jin and Ragna reminisce about the church. Celica starts to fade away and wishes them the best. Noel cries and Ragna tells her not to look back. Celica is gone. The teleportation is successful. Tsubaki, Hakumen, Hibiki, Kokonoe, Kagura, Tager, Rachel, Ragna, Jin, and Noel scheme. Hakumen gives Jin the Hihirokane. Jin unsuccessfully tries to convince Tsubaki not to fight. Noel's idea is to accept Izanami into her. What everyone saw in the Master Unit was the very first contact unit. Noel and her "sisters" weren't created as individuals. They were created with parts of a single soul. Noel, her sisters, The Origin, and Saya all share a single original soul. Kokonoe ran simulations and learned the Ikaruga Civil War was a fixed event and Ibukido is always destroyed. This is to allow Noel to be born. Noel is guessing she's special because she has the biggest part of The Origin's soul, so she's the closest to The Origin. Hakumen says he came from a world where Noel didn't exist. The Ikaruga War is not the singularity, it's the opportunity. Noel is The Origin herself, recreated, with Take Mikazuchi's blast as the catalyst. Noel suspected this. She's recognized as a human by everyone except for those outside of reason... meaning it's done through the Master Unit's power. Since Noel is The Origin, she can kill Izanami, but she also thinks she can stop Izanami. Hakumen agrees to let Noel try. Izanami is Amaterasu's Drive. A Drive is a materialization of one's "soul power." Since Noel has The Origin's soul, she can fuse with Izanami and grant her life. Kagura is worried Izanami would take control of Noel. Noel says no. Saya's soul is currently split between Noel and Izanami. This gives Noel confidence Izanami can't take over. Ragna says he'll take care of the Master Unit. It has its own will, but Ragna has a plan. Kagura will face Azrael. Hibiki will protect Homura. Ragna has a plan to beat Terumi too, but he can't explain it, or it will fail. Ragna says they can relax a bit since they have two days, but everyone else tells him there's only 14 hours left because of the strange time flow at the church. Ragna freaks out and Kokonoe wonders if it's really okay to leave the fate of the world up to him. The Embryo they see is like a "mirror" reflecting the world they're in. Kokonoe plans for them to use that to teleport straight to Izanami and make a preemptive attack. Jin asks why the Embryo won't lead to a different world. Koknoe says that after talking to Naoto, she learned no other possible worlds exist, so the Embryo will always lead to this world. Lambda will open the approach into the Embryo. Tsubaki will use Izayoi to hold back Requiem's phenomena intervention. Hakumen will use Okami to cut through time and open a path to Requiem. He'll save Jubei too. The operation starts immediately. They teleport above the Embryo and Lambda leads them in. Ragna, Noel, and Minerva appear to be somewhere in Ibukido. Kagura and Jin are in Kazamotsu. Tsubaki and Hakumen are in Yabiko. Rachel is gone. Jine asks if they're in different worlds, but Kokonoe says they're definitely in the time freeze in this world. Izanami appears to all groups. She says the time freeze doesn't stop her from acting, it just prevents her from leaving. She prepared this stage for their battle. She decided to separate Hakumen and Tsubaki after anticipating Kokonoe's group's plans. She invites them to stop her before the time freeze wears off and she's able to make Requiem explode. The groups can only communicate through Kokonoe. Requiem is the top priority. The stage is a collection of space fragments. The stage is oddly put together, so they should all stay in their groups and look around. If someone finds Izanami and Requiem (who are probably together), Minerva will guide everyone else to that spot. Kokonoe says there's no time for Hakumen and Jin's complaints. She says to ignore Jubei and Rachel for now. Kokonoe estimates they have three hours max. Kokonoe asks Makoto if she's found Naoto yet. Substory: Valkenhayn comes to kill Amane. He thinks if Amane is defeated, the world will make Rachel the Onlooker and she'll be saved. If it chooses someone else instead, he'll just keep killing Onlookers until Rachel is chosen. They fight. But Valkenhayn isn't allowed to change the world and therefore can't kill Amane. Valkenhayn says he wants to save Rachel Alucard over the Alucard Clan. Amane tells him what "he" intends to do, one who has the right to change the world. Amane tells Valkenhayn he must not interfere. Ragna's group tries to get to the Ibukido Cauldron at Noel's request. Tsubaki's group heads for the Kagutsuchi altar. Tsubaki talks to Hakumen about how she liked helping Jin brainstorm. Hakumen fondly remembers her as a good secretary. Kagura's group wonders why Izanami made this stage when there were other better ways to stall them. Kagura wonders if this is a trap when Azrael shows up. Azrael is annoyed they keep talking to Kokonoe, so he shifts space with pure strength to break communication. Azrael says he can take them on at the same time. Kagura convinces Jin to let Kagura fight alone because he has a plan. Jin lets him. Kagura calls out Trinity. Azrael proves he has no restrictions on him this time and punches Kagura into the colliseum. They fight and Azrael is amused. He says Kagura is a good appetizer. Azrael gets good hits in, but suddenly Kagura starts doing really well. Kagura compares Azrael to a kid throwing a tantrum. While Azrael has incredible speed and power, he has no technique, so Kagura has seen through his style. Jin and Trinity make it to the colliseum. Trinity says this is the power of a human risking his life for the sake of those he loves and wants to protect. Jin wants to know Kagura's plan... Trinity says Kokonoe just told him to do whatever it takes to defeat Azrael. Trinity is just there to teleport Azrael after the battle. Azrael releases his limiter, but Jin jumps in and freezes him, since Azrael has used up most of his stamina. Jin says Azrael said they could take him on together. Azrael admits defeat and Trinity teleports him away. Kagura is too injured to go forward. Lambda takes a chance to rest. Naoto (unwillingly) and Makoto jump into the Embryo. Rachel wakes up alone, bound by Hazama. Hazama knows a lot about Rachel. She's an immortal vampire and the posthumous work of Clavis Alucard. Just like "him," her existence is always resurrected. But she also carries over her "memories" thus far. He's less like one outside of reason and more like a creator. Hazama wishes he knew how Clavis made her. Hazama wants to know if he can destroy her. Hazama is performing an experiment to cut her existence into tiny pieces using the slowly constricting binding on her and then throw those pieces in the Cauldron. He wonders how long it would take her to reform in the vast Boundary. Rachel asks what he wants and Hazama says he wants to know. Rachel asks who he is, Hazama says he doesn't know, but everyone calls him Hazama. Hazama tells her the binding can easily be broken from the outside if someone comes to save her. Makoto and Naoto land and search for Noel. Hakumen and Tsubaki arrive at the Kagutsuchi altar and find Relius. It's not really Relius, just some information on him. Relius says he's here to observe Hakumen. They fight. Relius says he's sufficiently observed the form of the "vessel" and "soul." He'll use the data to "perfect" Ignis. "They" will take care of the rest here. Then Relius vanishes. Hakumen realizes that if Izanami knows where everyone is, she must be where Noel is going. Ragna and Noel follow Minerva to Ibukido. Ragna senses Izanami. He sends Minerva and Noel ahead while he takes Tenjo's dream from the nearby Lynchpin: Please watch over Bang, Kagura, my people, and Homura. Noel, Ragna, and Minerva find Izanami. Izanami tells Ragna that since he's not qualified, he's not affected by intervention from Noel, so he can kill her and take the true Azure, the Azure Flame Grimoire. Ragna says he won't do it and fights Izanami. Ragna claims he's Izanami's dream because he can kill Noel. Izanami thinks Ragna is just stalling. She prepares a killing blow against Ragna. When she is totally focused on Ragna, Noel attacks and commences observation. She tries to take Saya's soul. Izanami says she predicted this and will consume Noel's puny soul instead. Ragna comes and uses Soul Eater on Izanami. Ragna explains she can't oppose him because she gave up her dream. Even if her soul is stronger, she can't win the tug of war of souls. He apologizes that they had to team up against Izanami and activates the Soul Eater in reverse. Izanami screams and says she doesn't want to be saved. Noel and Izanami fuse. Minerva prevents Requiem from destroying the world with a counter explosion. Substory: Carl peers into the Cauldron in Kagutsuchi to learn what Relius know. Something shoots into his left eye and Nirvana immediately pulls him back. Carl is excited and says he saw the form of the world. He wants to know more. After Requiem was destroyed, Kokonoe lost contact with Kagura and learned he turned into Seithr. Tager and Lambda also turned into Seithr. Es appears to tell Kokonoe the will of the Azure. They lost their qualifications (their dreams), so they were turned into Seithr. Es says Doomsday can't be stopped: Someone must obtain the Azure or they must accept Doomsday. She sympathizes with Kokonoe for being like the people of Es's world. She will make a backup of Kokonoe. Es explains she is "Embryo Storage", the guardian of the Azure Gate, and an arbitrator. Kokonoe tells Ragna and Noel about Es. Ragna asks what an arbitrator is and Noel mutter "Kukurihime? An arbitrator between the Azure and Humans?" Kokonoe tells her not to access non-Noel memories yet. Kokonoe suggests they return the Master Unit to the Boundary and then maybe they can restore everyone. Kokonoe tells them to save the world, that's her dream. They lose communications with Kokonoe, but she reappears and says she's not dead yet. Jin is in a white space with Trinity. Hazama continues to torture Rachel. Naoto and Makoto decide to head to the Master Unit. Naoto sees Makoto's life number disappeared. Es appears and tells her she lost her qualification. Naoto is cautious of Es. Makoto also rejects the Azure. She doesn't want to make a new world and control people's minds or rely on a foreign power. Es commences backup of Makoto, then attempts to destroy the foreign element Naoto. Makoto jumps in and tells him to go ahead. It's her intuition that he needs to be there. Naoto hears Raquel's voice tell him to go to the Kagutsuchi Cauldron. Es says she needs to eliminate Naoto because he's impeding Doomsday, which is probably why Kokonoe sent him in. Makoto insists on protecting Naoto, so they fight. Es is really strong. Amane comes to see Makoto fade away. Makoto isn't scared, she trusts her friends to save them all. Amane says he intervened for Es sake, she shouldn't injure Makoto with her own hands. Amane says Naoto isn't in his jurisdiction. Es goes on to get Naoto. Noel and Tsubaki sense Makoto's passing. Tsubaki says Makoto can be saved if they return the Master Unit. Tsubaki and Hakumen find Jubei and Nu fighting. Jubei says Nu wants the Master Unit. Tsubaki activates Izayoi. They fight Nu. Nu almost kills Tsubaki, but Jin saves her. Noel and Ragna arrive too. Ragna says he's the only who can handle Nu. Nu wants to merge with Ragna and destroy everything in this boring world. Ragna senses she absorbed Take-Mikazuchi. They fight. Ragna wins. Noel says Nu's soul has already become independent and they can't fuse. So Ragna just takes Nu's memories. Nu asks if that means they're going to become one. Jubei and Hakumen realize Ragna is really strong now. Hakumen challenges Ragna because he wants to know why he's so powerful now. They fight because it's apparently faster than talking. Hakumen learns Ragna's not stronger, the qualified are just weaker because their souls are being absorbed into the Boundary. Ragna is powerful because he's not qualified. Nine was strong because she doesn't use a Drive. Hakumen understands they need to focus on the Master Unit right now and ignores his grudge with Ragna. Terumi reactivates Nu and orders her to kill everyone. Trinity says there's a restraining field, which means Terumi must be nearby. She tells Jin to search for him. Trinity tells Jin to hurry or Nu's soul will be destroyed. Nu attacks Tsubaki, but Hakumen takes the blow. Hakumen is happy he was finally able to protect her. While Hakumen is distracted with Nu, Terumi appears and uses Hihirokane on him. Terumi says he'll be taking his original body back and takes the Susano'o unit as his vessel. He says it's disgusting as usual being in the Susano'o. Dark Susano'o is really strong. No one can do anything against him. Terumi says it's time to stop ending the world and time to start destroying it. Terumi tells Ragna to meet him on the other side. Terumi takes Noel and the Master Unit chases after him. Relius comes and sees Hazama's experiment. Relius has come to go to the Boundary for verification using Ignis since his time of observation in this world is over. Relius says he left his son behind with his left eye. Carl may prove to be interesting. Hazama thanks Relius for telling Terumi about Hakumen's soul for him. Hazama hopes they meet again. They strategize with Kokonoe. Kokonoe thinks Terumi is outside the Embryo, in the world they came from. The Master Unit is gone, but still in a place where it can observe this world. Ragna guesses Terumi's goal is to open the Gate outside of this world and obtain the True Azure. Ragna guesses that "destroy" the world means the world Terumi would create after obtaining the Azure would be really rotten. Jin, Trinity, and Ragna can travel outside using the Kagutsuchi gate. Tsubaki is ordered to stay behind and watch Jubei and Nu. When Ragna's group leaves, Jubei verifies that Kokonoe is gone and they're just talking to a backup. Sector Seven is about to run out of power, so even that will be gone soon. Jubei apologizes for being a bad dad and Kokonoe tells him to tell that to the real her later. Ragna returns to hear this and consume Tsubaki's dream. Terumi fights Es at the Gate. He says this isn't a holy place, it was created for 'us.' They fight and Terumi wins. Terumi says Es has no more possibilities. Es is revealed to be a false guardian. Terumi says Ragna is the true Azure Guardian. Es says she must fulfill her duty as Embryo Storage and protect the memories of those she loves. She vanishes. Terumi is mad "it" is not complete, but says it's fine since there's just one last person left. Terumi is excited to surpass the Master Unit soon and finally be free. Es appears to Naoto. She says she trusts him. She says if his existence was born from "possibility", then he should lend his aid. Es says if she is the past, then Naoto is the future. Rachel calls out to Ragna and Ragna goes to find her. Trinity tells him not to go. Ragna finds Hazama torturing Rachel. Hazama says Ragna can ignore him and go ahead to Terumi. Ragna gets ready to attack, but Hazama threatens to throw Rachel into the Cauldron, where it will be difficult to find her and she may be tortured for all eternity. Hazama says he tried this experiment before with Saya, back when he was trying to destroy her soul, but she broke after only a few dozen times. Rachel has gone much more already. Ragna attacks Hazama out of anger. Hazama enjoys the hatred directed at him as well as the feeling of destroying something someone else cares about. Ragna and Hazama both activate BlazBlue. They fight. Hazama tries to throw Rachel in the Boundary, but Naoto arrives just in time to catch and save her. Rachel wonders if Hazama is trying to become an independent entity. Ragna is crazy with rage and losing control. Naoto stops Ragna from killing Hazama and becoming the Black Beast. He says Ragna shouldn't attack to destroy, he should fight just to save. Naoto says it seems like Ragna is a possibility of himself. He says he'll save Ragna. They fight. Ragna wakes up. Naoto tells Hazama he should be happy Naoto saved him. Hazama says, 'Saved me? You, saved me? ...Heh heh heh, hahahaha! I see, this truly is... Interesting... Heh. It seems... There's still a "future" left.' Jin finally breaks into the area, Trinity says "Kazuma... No, Hazama..." Hazama says he would rather die than be "saved" by Ragna. Trinity says "Hazama-san..." and Hazama says, "I really hate those kind and compassionate eyes of yours... Anyway, Ragna. I look forward to the fun possibilities." He jumps into the Cauldron. Trinity sadly says, "Kazuma-san...", but Naoto says Hazama is still alive. Then he backtracks and tells everyone it's just his intuition. Naoto says the Azure he's looking for isn't in this world and it feels like his role is over. He says his actions were for the sake of his... no... "our" world. Naoto asks Ragna to stop the suffering of the Murakumo units. Rachel (overlaid with Raquel's voice) thanks Naoto right before he disappears. Rachel will see Ragna, Jin, and Trinity through the Boundary to the other side. Substory: Amane sees Es off. He asks why she changed her mind, Es said it's because she believes more in her friends than the "world." Ragna and Rachel are by themselves. Ragna says his goal is to end the Central Fiction "Dream of God." Ragna says he's off. He gives Rachel a hug first and thanks her for everything. She objects at first, but eventually hugs him back. Then he says goodbye. Valkenhayn takes Rachel away. Ragna, Jin, and Trinity find the Gate. Terumi attacks and provokes them. They say they just want Noel back. Terumi shows them the The Origin in the Master Unit, calling her the true Noel Vermillion, and Jin asks if he fused Noel with her. Terumi tells them not to blame him, it was the humans who created it. The Origin was the very first monster who Ragna didn't save. Terumi asks if Ragna wants to go hug her. Ragna asks what's wrong with him and Terumi asks what Ragna's problem is, Terumi just showed them Noel like they wanted. Terumi asks how many worlds humanity destroyed in their desire for the power of a god? Ragna says Terumi taught them how to do it. Terumi says humans collect only the possibilities that are convenient for them and create a future only for themselves. The worlds that lost their possibilities are destroyed by Doomsday, the Black Beast. From the very start, Terumi was what they would call a god. Jin asks who would worship him. Terumi says he doesn't want worship. Terumi's goal is to exceed the Master Unit and destroy every world it creates. Those in new worlds will fear him and that fear will make him grow stronger than the Black Beast. He'll create a reality where only fear will exist. He won't let anoyone Intervene on him anymore. He reveals he actually absorbed Noel into himself so Intervention won't affect him. He'll awaken Noel with Ragna and Jin's lives and then obtain the True Azure. Then he can exit through the Gate and finally be free. Ragna says he's here to reclaim everything Terumi took from him and Jin agrees. Jin fights Terumi. Jin manages to perceive him. Ragna makes himself go out of control and activates BlazBlue. Ragna fights Terumi. He pulls Terumi out of Susano'o. Trinity helps Jin take Susano'o, then he slays Terumi and Ragna. Suddenly, Ragna and Terumi are in the Azure Horizon beyond the Gate, a world where only those chosen by the Azure can go. Either Ragna or Terumi will get the Azure. The Azure doesn't distinguish between what humans decide is good or evil, it simply answers those who desire it. Terumi says Ragna opened the Gate, Ragna says it was actually Noel, no them, who decided to take a gamble on Ragna, that he could eliminate a god. Terumi's existence is too special, his connection to the structure of this world is too deep... the root, that is. Ragna says this was his goal. Susano'o has been succeeded under the Master Unit. By allowing Jin to take control of Susano'o to slay them, Susano'o is now a hero who saved the world from the Black Beast. Nobody is afraid of Terumi. Ragna fights Terumi. Ragna kills Terumi and retrieves Noel from him. Ragna says it's time to wake up from the dream. Noel is restored and merges with The Origin. Trinity makes Noel's old NOL clothes for her (because she's naked). Ragna asks Noel to let him to talk to The Origin, but Jin tries to stop him. Trinity forces Jin out of Susano'o and back into a Jin body. The Jin body shouldn't be able to move for a while. Ragna fights Noel to take her dream. Jin manages to interfere and says he won't let Ragna kill himself. Ragna apologizes for breaking their agreement that Jin could kill him. Jin explains to Noel that Ragna intends to erase the memory of himself from everyone. Ragna explains. Nine said the world is a dream seen by The Origin, aka Saya. But that's technically wrong, this world is just a reconstruction, it's not actually the dream Saya is watching itself. Noel asks what the dream is. Ragna says a certain "place" gives the opportunity to start everything over. Noel isn't the key to the dream because she doesn't always exist. By stopping Ragna from becoming the Black Beast, she opened up a new possibility. If a certain someone was gone, the world would end immediately. Ragna is the actual dream watched by god. As long as he exists, Saya's dream will never end and the nightmare will ultimately be repeated forever. Ragna says even if a nightmare is bad, when you wake up, you can just forget about it. Jin says he'll just kill the existence of "Brother" so that Ragna can just exist as the "Bloodedge" instead. Jin fights Ragna to stop Ragna's dream, but fails. Ragna hugs and says goodbye to his siblings. He says he wants to protect their world, then takes their dreams. He leaves the Susano'o Unit to Trinity. Trinity asks where he's going and Ragna says there's one more person who needs to awaken from their dream. He'll take their dream too and then that will end it. Trinity thinks everything started from humanity discovering the Susano'o unit deep underground. She plans to return the Susano'o to Boundary where humans can never reach it again. Hakumen (dunno how he's there again, but he's listed as the speaker) thanks Trinity and says goodbye. Trinity says "Thanks to you, I was able to meet Celica, Valkenhayn, Jubei, Hakumen, and Nine again." She thinks it's a miracle she was even able to meet "him." She says, "I'll take that miracle with me, and go... to a place where we can sleep in peace." Ragna goes to the Master Unit. He sees that Kushinada's Lynchpin was modeled after it, so is able to repeat what he did with Tenjo to talk to someone he addresses as Saya (she uses Izanami's Voice Actress.) Ragna apologizes for making her wait so long. She says she was all alone and scared and asks why he abandoned her. She asks why he tried to kill her and why he became a black monster. Ragna said he didn't know another way to stop her. She asks why he wanted to stop her, she was just doing what she was told. She hated that world she was making, she just wanted to be with Ragna. Ragna says he's sorry and that they'll be together from now on. He activates the Master Unit. He commands it to erase this nightmare from the world and from all memory. Amane says Ragna was magnificent. Ragna's right side is looking black and red. Ragna says it looks like Amane is the last one. Amane assures Ragna nothing is left of Ragna in the Takamagahara System. Ragna says he'll return everyone's dreams to the Azure. The world that'll be created won't be affected by intervention from Amaterasu or Takamagahara. Amane says, "Hope in the form of possibility, extending from all directions, in the past, present, and future... I've never seen a world reconstructed on such a large scale before... So this is the True Azure..." Ragna and Amane vanish and Ragna's sword is left in front of the Gate. (This is an anime sequence with little talking. You're best off watching it.) Noel becomes a Sister at the church. Lambda is another Sister. Nu is on a bed inside, possibly recovering. Homura is Imperator; Kagura, Hibiki, and Jin are with him. Bang leads the rebuilding of Ibukido. Amane wanders with his troupe. Carl explores ruins, it looks like the First District. His left eye has a Relius-like mask over it. Litchi, Platinum, Linhua, Kajun, and Mai hang out. Jubei watches them from an alley. Tao returns home to play with the kids. Tager is with Bullet. Kokonoe works at her desk and ensures Azrael is still in his prison. Es continues to guard the Gate. Naoto lands in a world where he finds Raquel. Valkenhayn prepares tea for Rachel. Rachel is on a hill in front of Ragna's sword and an unmarked grave (I think this might be Celica's grave.) Hakumen's sword appears behind Rachel and Rachel tells Tsubaki Yayoi she was waiting. Tsubaki says that name is nostalgic. (Only Tsubaki's hair and sword is shown in this whole sequence.) Tsubaki says she came to fulfill a promise. Tsubaki asks Rachel whose sword that is. (Rachel tears up.) Rachel says she doesn't know, but the will to 'never give up' remains. It's proof of possibility. Tsubaki says something like Rachel will fall into the Hell of possibility too, Rachel says even if it's Hell, she'll choose it. As long as hope remains, she'll choose it. Tsubaki puts her sword down. Then she says, "I shall find you, I promise." Tsubaki and Rachel are gone and the Rachel's ribbon is tied to the sword. A white bird lands on the unmarked grave, but the sword is missing. Please do me a favor and visit these sites! Should Jun really be calling herself a ninja? 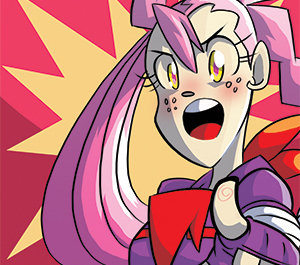 Decide for yourself in this fun action-comedy webcomic! 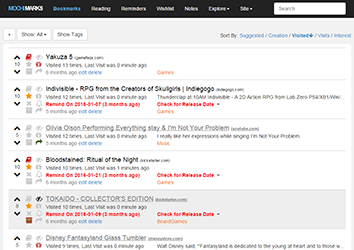 Mochimarks is a bookmarking website focused on helping you regularly use your bookmarks. Features flexible reminders! 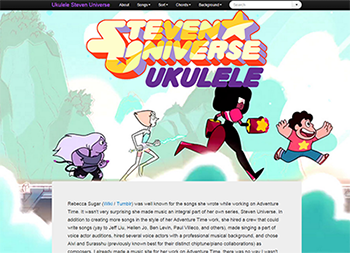 A complete Steven Universe vocal songlist, complete with lyrics and chords so you can play along!